"[PA] Prime Minister Rami Hamdallah said that the Palestinian Martyr (Shahid) has become a global symbol of liberation and freedom, and every Martyr’s name has become connected to a resolute struggle against the occupation and its tyranny, and to the eternal connection to the land and the homeland. Sbeihat said: 'The ceremony is a small part of our obligation to the Martyrs, their families, and those died in defense of the land of Palestine. They deserve that we mark every memorial day, as their pure blood and souls have given us the ability to be united.' He noted that 226 Martyrs joined the processions of Martyrs in 2015, and 272 in 2017 (sic., 2016), as part of the ongoing Jerusalem uprising. Sbeihat also praised the president and his government for standing by the Martyrs' families. During the ceremony they honored... Martyr Yasser Dhiab Hamdouni (i.e., terrorist, murdered 1) from Jenin, [former Grand Mufti of Jerusalem Haj] Amin Al-Husseini, and the Martyrs of the Arab and Egyptian armies." 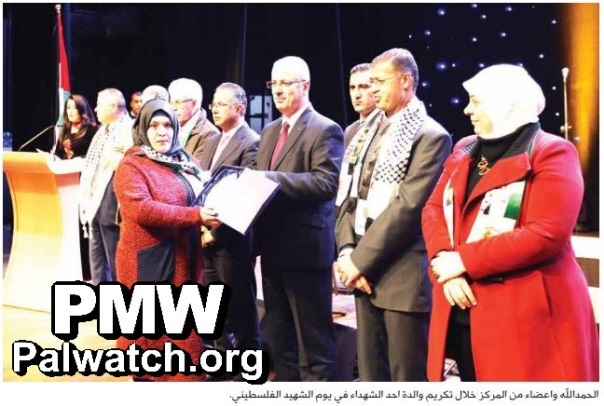 "Hamdallah... during the honoring of the mother of one of the Martyrs on Palestinian Martyrs' Day"
Ahmad Musa Salameh was involved in Fatah's first terror attack on Jan. 1, 1965, which targeted Israel's National Water Carrier. Salameh was killed by Jordanian soldiers following the attack. Yasser Dhiab Hamdouni - was serving a life sentence for participating in the murder of Israeli citizen Avner Maimon in the Palestinian town of Ya'abad in the West Bank (June, 12, 2003). Hamdouni, a member of the Al-Aqsa Martyrs’ Brigades (Fatah’s military wing), died on Sept. 25, 2016, after collapsing while exercising in the Israeli Rimon Prison yard. Haj Amin Al-Husseini - Grand Mufti of Jerusalem at the time of the British mandate, and spiritual and a political leader of the local Arab population. He strongly opposed Zionism and was behind riots and attacks on Jews. During World War II he actively collaborated with Nazi Germany, meeting Adolf Hitler personally and recruiting Muslims for the Nazi army.